With our state-of-the-art cut and weld capabilities, we've redefined the way you'll think about plastic bulk containers Now you can choose a CustomtainerTM exclusively from Universal Package. 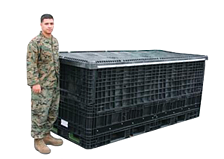 Until now, if you wanted to take advantage of the benefits of collapsible, plastic bulk containers, you've been forced to work around standard available footprints - 32" x 30", 40" x 48", 45" x 48" - extended length or extended height containers. While these sizes work perfectly in many applications, there are times when a custom size would be preferable. By customizing the container, you can pack, ship and store items as densely as possible, and eliminate wasteful air pockets. The same thinking applies to hand totes. 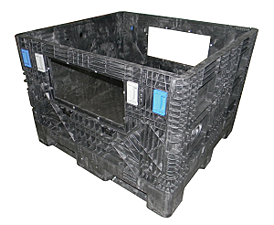 We can now offer you all the advantages of using collapsible, plastic bulk containers, and modify the width of the container to any size between 12" and 48", and provide virtually any length you require. Drop doors and open side walls are still options that can be incorporated into our custom bulk boxes, just as they are in standard size containers. 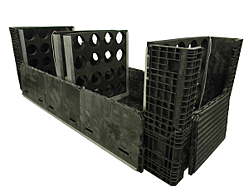 Our sophisticated cutting and welding techniques result in a bulk box that provides the same quality and structural integrity you've come to expect in an off-the-shelf container. container with customized lid to fit.